VietPress USA (Feb. 16, 2019): On last Friday, Feb. 15, 2019, at the deadline of 3 weeks of temporary ending Government shutdown, President Trump signed a National Emergency to bypass Congress for using US$ 8 Billion for building 234 miles of southern border wall between US-Mexico. Trump boated that if he win the Presidential election, he will build up a wall along southern border with Mexico at Mexico's expenses; but Mexican President denied to pay any penny for Trump's promise. Therefore Trump asked Congress to allow him to use a fund from Tax payers of US$ 5.7 Billion for the wall. Regret that Democrats won the majority and control the House. Democratic Speaker of the House Nancy Pelosi didn't accept Trump's request. Trump closed partial federal government 35 days to pressure Congress for his fund. He failed and now Trump announced a National Emergency in bypassing Congress to secure the fund of US$ 8 Billion from U.S. Military budgets. This is more than the fund of US$ 5.7 he insisted. Democratic and some Republic Lawmakers are blaming Trump misuse his presidency power.The move that is almost guaranteed to draw the White House into a lengthy legal battle over the president's ability to use his executive powers for that purpose. A national big protest plan will organize mass rallies against Trump's National Emergency from New York and North Dakota to California and Texas all to counter the order Trump signed last Friday. 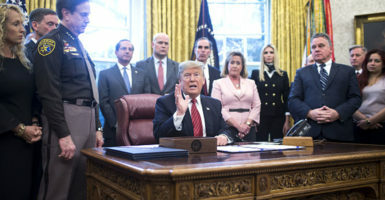 WASHINGTON – Protests across the nation are planned Monday in response President Donald Trump's national emergency declaration. The protests are being planned from New York and North Dakota to California and Texas all to counter the order Trump signed Friday, which freed up billions to construct a wall along the southern U.S. border with Mexico. 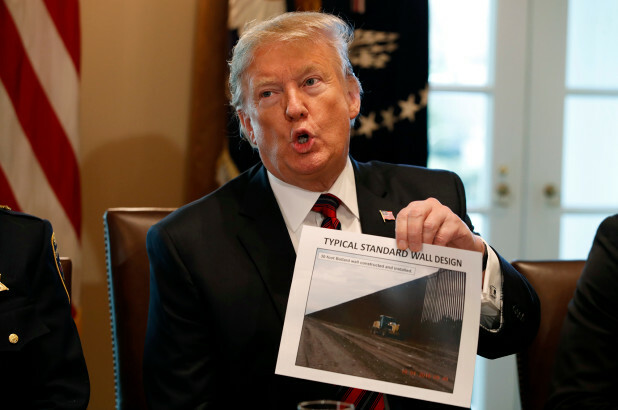 The national emergency and other measures will free up $8 billion – far more than the $5.7 billion he initially demanded – to garner funds for 234 miles of wall, the White House said. It's a move that is almost guaranteed to draw the White House into a lengthy legal battle over the president's ability to use his executive powers for that purpose. Already, the move has further divided Congress, including some within the Republican party, several lawsuits have been filed and now dozens of protests are being planned to show dissatisfaction with Trump's move. Some of the rallies are being organized by MoveOn.org, a social justice and political action organization. Others are also listed on rallylist.com. "We are mobilizing nonviolent rapid-response events to stand up against Trump's #FakeNationalEmergency to defend our democracy and immigrant, Muslim, black, and brown communities from Trump’s dangerous national emergency power grab," MoveOn.org lists on its website for the nationwide events, many planned around noon local time. The site allows one to put in their city and state to find the nearest planned protest. Along with the planned rallies Monday, a series of smaller protests have been planned over the weekend. One took place on Friday, just hours after Trump signed the order. Several people were arrested while protesting against the national emergency declaration outside a New York City hotel that bears Trump's name. The NYPD wasn’t immediately able to say how many people were taken into custody Friday night outside the Trump International Hotel & Tower in Manhattan. Video shows protesters going peacefully with their hands zip-tied behind their backs as officers lead them to police vans. They’ll likely be charged with disorderly conduct and blocking traffic. Protesters outside the Columbus Circle hotel held signs with slogans such as “Abolish I.C.E.” and ’Trump Is The Emergency.” Trump developed the 44-story hotel, but it is owned by other investors.